Hosted by Rob Kelly (The Aquaman Shrine) and The Irredeemable Shag (Firestorm Fan), THE FIRE AND WATER PODCAST focuses on DC's King of the Seven Seas and the Nuclear Man! It’s Christmas, time to check under the tree for some Aquaman Mego toys! Rob welcomes back Mego experts Brian Heiler (PLAIDSTALLIONS) and Chris Franklin (SUPERMATES PODCAST) to talk about the various Aquaman action figures produced by the legendary company of the 1970s and 80s! Have a question or comment? Looking for more great content? Opening theme, “That Time is Now,” by Michael Kohler. Thanks for listening! Fan the Flame and Ride the Wave! 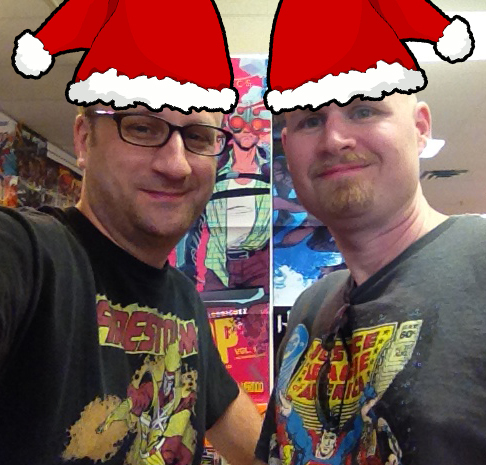 It’s that time of year again, so Shag and Rob are back to discuss two of their favorite Christmas comics! First up is “Merry Christmas, Justice League–Now Die!” from JLA #60 by Mark Waid, Cliff Rathburn, and Paul Neary, followed by “Who’s Afraid of the Big Red S?” from BATMAN AND THE OUTSIDERS #19 by Mike W. Barr and Jim Aparo! Ho Ho Ho! Fan the Flame and Ride the Wave! 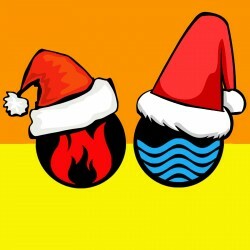 Images for THE FIRE AND WATER PODCAST Episode 182! Click each image to enlarge! Leave your comments over on the podcast post by clicking here! Rob is joined by special guests Darrin and Ruth Sutherland (WARLORD WORLDS) to discuss the Aquaman back-up strips from ADVENTURE COMICS #435-437 by Steve Skeates, Paul Levitz, and then-newcomer Mike Grell! Images for THE FIRE AND WATER PODCAST Episode 181! Click each image to enlarge! Leave your comments over on the podcast post by clicking here! 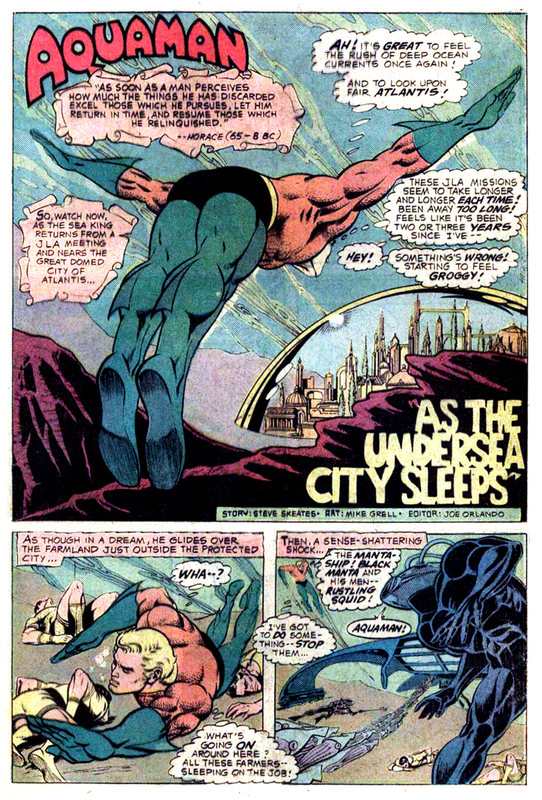 Some of Mike Grell’s work on the Aquaman back-up strips from Adventure Comics #s 435-437! Shag’s World Tour 2016! This episode Shag is joined by an all-star cast of Nuclear Subs from around the country to discuss their favorite “Mort” characters! You’ll hear from Stella and Tom Panarese in a Mexican restaurant! Next up is eating ice cream with Keith G. Baker, and Darrin & Ruth Sutherland! After that it’s off to Kyle Benning’s recording studio for a chat! Then Doug Zawisza takes us to Green Lantern Pizza! Next is Little Russell Burbage, Professor Alan Quarterbin, and Aaron Bias at an all-you-can-eat Mongolian barbecue. After that, Ben Avery and Luke Daab hang out at BuyMeToys.com! Finally, we visit the home of Jarrod Alberich, The Yard Sale Artist! Images for THE FIRE AND WATER PODCAST Episode 180! Click each image to enlarge! Leave your comments over on the podcast post by clicking here! Shag & Rob present the next installments of “Whatever Happened To…?” We love these back-up strips from DC COMICS PRESENTS! This time we’re covering adventures from DCCP #37 & 38, featuring Rip Hunter…Time Master and the final adventure of El Vengadore Rojo…The Crimson Avenger! Images for THE FIRE AND WATER PODCAST Episode 179! Click each image to enlarge! Leave your comments over on the podcast post by clicking here! 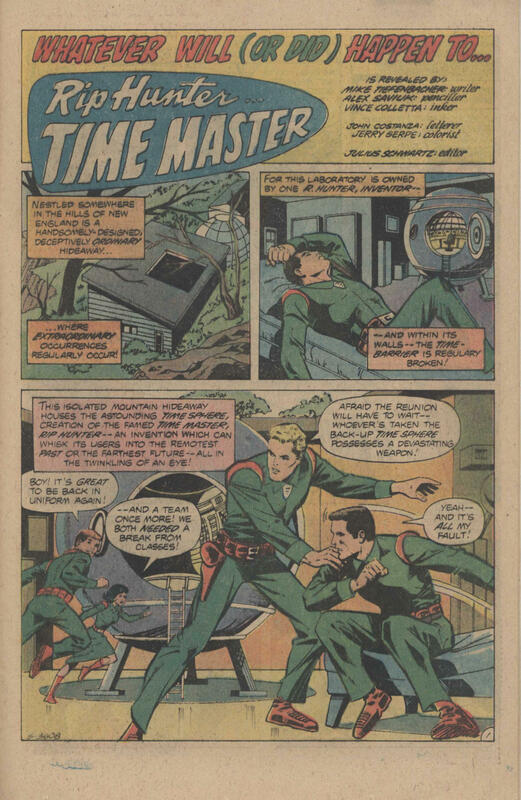 Whatever Will (or Did) Happen To… Rip Hunter, Time Master! From DC Comics Presents #37, by Mike Tiefenbacher, Alex Saviuk, and Vince Colletta. It’s all been leading up to this! Shag and Rob talk Sea King and The Nuclear Man past and present, looking at AQUAMAN #’s 7-8 by Dan Abnett, Brad Walker, Scot Eaton, Philippe Briones, and more, followed by a return to Classic Firestorm with THE FURY OF FIRESTORM #28 by Gerry Conway, Joey Cavalieri, Rafael Kayanan, Pablo Marcos, and more. It’s the debut of movie star Slipknot! We finish with your Listener Feedback!